The preperitoneal space is further expanded under direct visualization. After identification of the left anterior-superior iliac spine, a 5 mm port is placed 2 cm medial to this bony landmark. A 5 mm trocar is placed on the left pararectal line, 1-2 cm caudal to an imaginary line extending from the umbilicus to the left anterior-superior iliac spine. In a similar manner, two additional ports are inserted in the contra lateral side of the abdomen. Overall, the port placement duplicates laparoscopic entry during extraperi-toneal laparoscopic radical prostatectomy (Fig. 1) (23). The space of Retzius is entered and the anterior surface of the prostate capsule is cleared of the overlying fatty tissue. 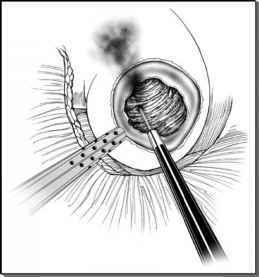 The superficial dorsal vein on the anterior aspect of the prostate is carefully coagulated with the harmonic scalpel.